To ensure you receive our e-mail, please add IEEEService@ieee.org to your address book now. "RFID-Based Automatic Scoring System for Physical Fitness Testing"
"Simultaneous Sensor and Process Fault Detection and Isolation in Multiple-Input-Multiple-Output Systems"
"Design Techniques and Applications of Cyberphysical Systems: A Survey"
"A Project-Product Model-Based Approach to Planning Work Breakdown Structures of Complex System Projects"
"Power-Efficient Provisioning for Online Virtual Network Requests in Cloud-Based Data Centers"
"Design of GPS Anti-Jamming Systems Using Adaptive Notch Filters"
"Efficient Solutions for Enhancing Data Traffic Management in 3GPP Networks"
"Implementation of Trust and Reputation Management for Free-Roaming Mobile Agent Securitym"
"MoMoRo: Providing Mobility Support for Low-Power Wireless Applications"
"On the Overheads of Ad Hoc Routing Schemes"
The Systems Council currently has six active Distinguished Lecturers (DLs). The purpose of this program is to increase awareness about topics relevant to Systems Council by creating a pool of subject matter experts who are willing to speak to IEEE Chapters, Sections, Societies and Councils. To view the DLs, find out how to request a DL speech, or apply to become a DL, visit our Web site. A Chapter is a geographical sub-unit of the an IEEE entity and is established by petition to the IEEE. Chapters are concerned with representing and fulfilling the needs of the member in their specific geographical area. Chapters allow members to meet face to face and host local activities. The Systems Council currently is looking to expand through the use of Chapters. Creating a Systems or Joint Chapter is easily done through a petition, submitted to IEEE. For more information on this process please visit the IEEE Web site or contact Rich Hochberg, VP Member Services. To view a list of current Systems Chapters, visit our Web site. Engineers today start their careers with excellent technical skills and subject matter expertise. The Systems Council Newsletter includes time sensitive news useful to its members, and highlights content of the current issue of IEEE Systems Journal. The first IEEE International Symposium on Systems Engineering (ISSE) will be held in Rome, Italy 29-30 September 2015. This symposium seeks to create an interactive forum for the practice of systems engineering across the multiple disciplines and specialty areas associated with the engineering of complex systems. View the Call for Papers. The 10th Annual IEEE International Systems Conference will take place 18-21 April, 2016 in Orlando, Florida, USA. View a brief history of this conference. The conference caters to both practitioners and academics, providing a forum to exchange ideas and experiences on technology, methodology, applications, study cases, and practical experiences. View the Call for Papers for more details. The IEEE Systems Journal is intended to stimulate awareness, appreciation and utilization of systems thinking and the supporting systems engineering disciplines, especially for complex systems, systems-of-systems, and complex cyber-physical systems, across many domains and application areas. Do not miss the opportunity of submitting your most recent results for possible publication in the IEEE Systems Journal! Visit our Web site to view all the Call for Papers. To prepare and submit your manuscript please follow these instructions. Significantly extended and expanded versions of papers previously published in conference proceedings can be submitted; provided that sufficient original material and innovative aspects are included (description of the extensions beyond the conference paper should be provided at the time of submission). 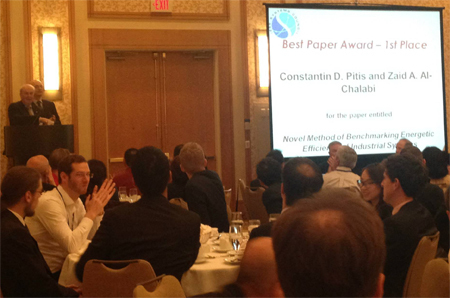 Congratulations to our Best Paper Award winners, Constantin Pitis and Zaid A. Al-Chalabi for the paper entitled, "Novel Method of Benchmarking Energetic Efficiency of Industrial Systems." The IEEE is committed to excellence and the IEEE Systems Council Technical Committees (TC) are designed to flexibly respond to any engineering interests whether they be long or short term ones. Take a closer look at the committee ideas that are under development. To participate in one of the TCs, please contact Roger Oliva, VP Technical Operations for the Systems Council. Please view our Web site for more information. It is with great sadness and sorrow that we inform you of the passing of our dear friend and colleague, Mr. Frank Reyes. Frank was a long-time supporter of the Systems Council and selflessly gave his time and expertise by being a wonderful and effective volunteer serving as vice president for finance, secretary and an BoG member. Please stay tuned for an upcoming "In Memoriam" article in the Magazine and this web site about Frank, his life and his contributions to I&M Society and his profession. We all will miss Frank terribly. The Systems Council met for their Spring AdCom Meeting Telecon on 16 April 2015. Their next meeting will be held on 1 October 2015 in Rome, Italy in conjunction with the IEEE International Symposium on Systems Engineering (ISSE). Click to view a listing of the members of the Systems Council Officers or the Systems Council Society Member representatives from our Web site. Copyright 2015 IEEE - All rights reserved. Use of this newsletter site signifies your agreement to the IEEE Terms and Conditions. If you would like to be removed from this e-mail distribution, please [Response: Unsubscribe from List]. Replies to this message will not reach IEEE. Due to local e-mail service/provider settings, random characters may appear in some instances.